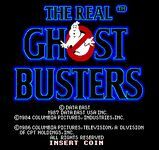 Derived roughly from the cartoon, play three Ghost Busters in cooperative play. This is a scrolling shooter. Shoot bushes, terrain, ghosts and try to capture badies in your plasma ray. Collect various power ups to increase energy and firepower. Green goo shields also available.